Fruitful Living LLC, the local Jamba Juice franchise partner, have just revealed the opening date of their third location in Tennessee in Historic downtown Franklin….. and it’s oh, so soon! The new Jamba Juice, located at 504 W. Main Street between Fifth and Sixth Avenue, will open on Saturday, May 23, 2015 at 8 a.m. 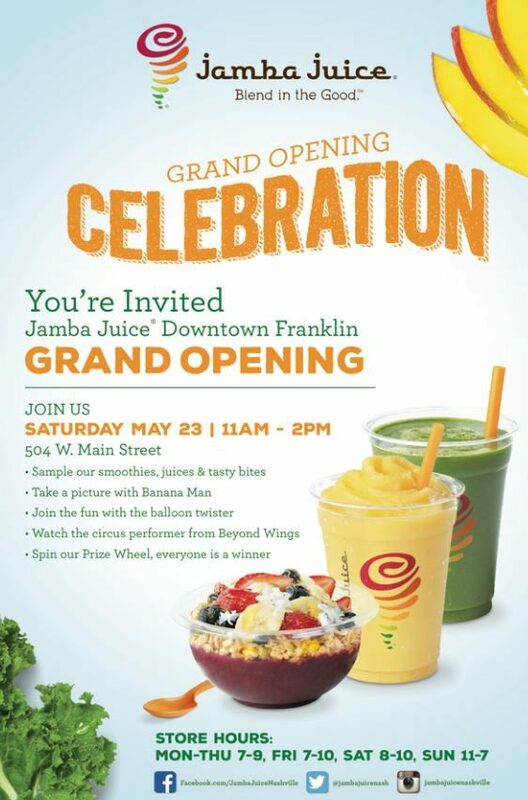 The downtown Franklin location will also host their Grand Opening celebration on Saturday, May 23–with all smoothies and juice being half price, all day! Plus: From 11AM to 2PM, festivities will include menu sampling, a prize wheel of giveaways, and entertainment by Jamba’s banana man, a fun balloon artist, and professional hoola­-hoop dancer. The downtown Franklin opening continues Jamba Juice’s rich tradition of providing a wide variety of nutritious and freshly­ prepared menu selections that are wholesome and healthy. The Jamba Juice menu offers beverage choices for every palette and taste, with strong roots in their hallmark smoothies and freshly ­squeezed juices which are made to order with whole food ingredients. Jamba isn’t just about beverages –­ guests can also enjoy a variety of food items including organic oatmeal, breakfast wraps, sandwiches, Artisan FlatbreadsTM, kid’s meals and a variety of baked goods and snacks. Hours of operation for the new downtown Franklin location are Monday through Friday 7AM to 9PM, Friday 7AM to 10PM, Saturday 8AM to 10PM, and Sunday 11AM to 7PM.